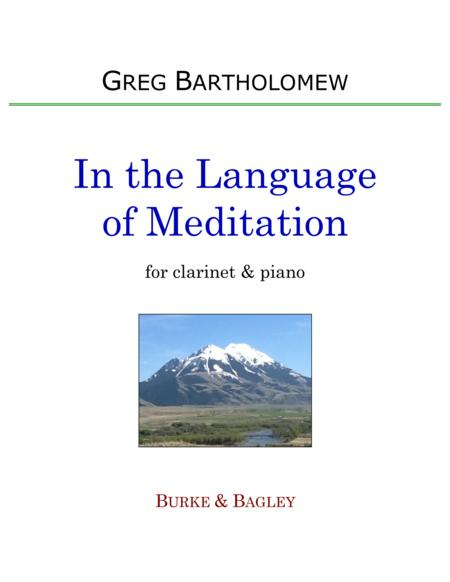 Composed by Greg Bartholomew. 21st Century, Contemporary Classical, Impressionistic, Post-Romantic, Recital. Score, Set of Parts. 40 pages. Burke & Bagley #BB324. Published by Burke & Bagley (S0.18473). IN THE LANGUAGE OF MEDITATION was originally composed in 2013 for viola & piano in memory of violist Ingrid Buschmann (1954 - 2013). The adaptation for clarinet & piano was made in 2014. Total duration: approx. 14 minutes.IN THE LANGUAGE OF MEDITATION is in three parts:I. Observations from a Rooftop Garden II. Contemplating a Mountain with Love III. Reflecting on a Visit with BirdsWatch the YouTube video of the premiere performance: http://youtu.be/k67fuvv0vUU?list=PLC467B58A453D766A .